When we tell people that we are planning to adopt from foster care, we tend to get one of two reactions. Either they tell us how incredible, amazing, awesome it is, or they tell us some grave concerns about the risks involved. Some people, especially those who care most about us, are very concerned about the effects of the adoption on our current children, our marriage, our life as it is now, etc. These fears are certainly founded. We are embarking into an unknown. Certainly we will do all in our power to make wise decisions and minimize the risk, but there is risk. And there will be effects. Life will be different. So when choosing books for this week, I chose ones that address the idea of taking risks to follow God. 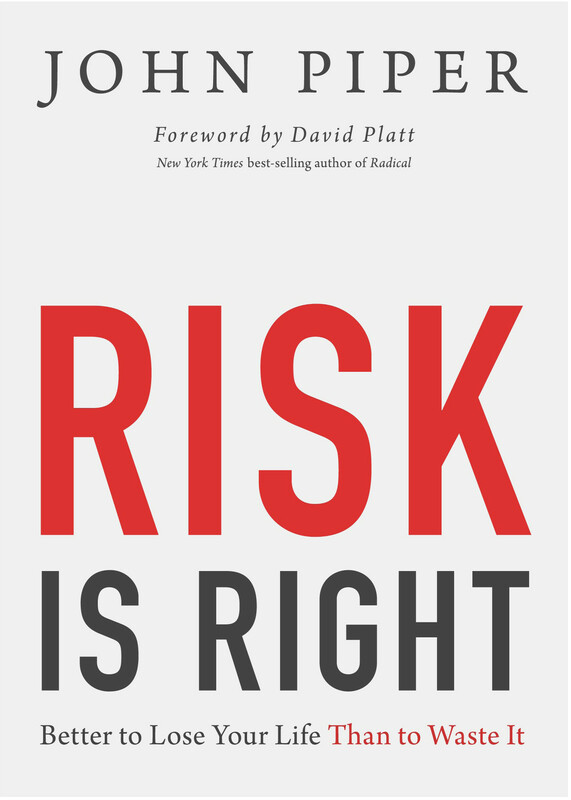 The first book I read was Risk is Right: Better to Lose Your Life Than to Waste It by John Piper. This book is actually an expansion of a chapter from his book, Don't Waste Your Life, and as such is very short! Unfortunately I had to return this book to the library before I wrote this post, so I don't have any quotes to share with you, but I will give you an overview. Basically Piper is explaining how the Bible calls us to be risk takers in order to advance the will of God. He spends much of the book showing examples of people from the Bible who have taken risks. He points out that they made bold choices and actions without knowing the outcome. He shows how God does not promise to make things work out perfectly in this world, but that our reward is eternal. 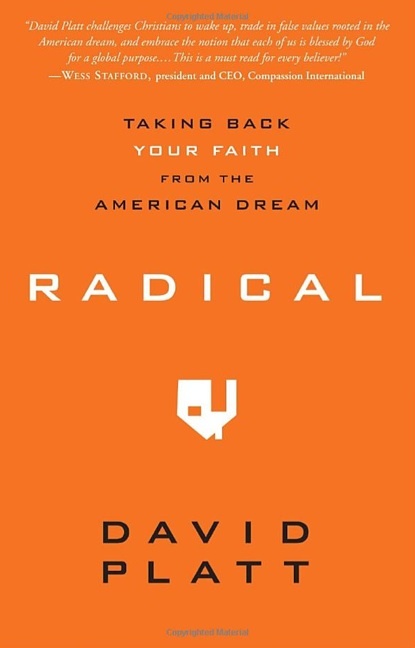 The second book I read was Radical: Taking Back Your Faith From the American Dream by David Platt. This book is very similar in premise to the previous one. Platt believes that we have allowed the "American Dream" to shape our view of Christianity. He combats the idea of the "prosperity gospel". He says, "Somewhere along the way we [have] missed what is radical about our faith and replaced it with what is comfortable. We [are] settling for a Christianity that revolved around catering to ourselves when the central message of Christianity is actually about abandoning ourselves." He talks extensively about the Great Commission in Matthew 28:19-20, "Go therefore and make disciples of all the nations, baptizing them in the name of the Father and the Son and the Holy Spirit,teaching them to observe all that I commanded you; and lo, I am with you always, even to the end of the age." Much of the book centers around our need to bring the gospel to those around the world who have never heard it before. "While caring for the poor is not the basis of our salvation, this does not mean that our use of wealth is totally disconnected from our salvation. Indeed, caring for the poor (among other things) is evidence of our salvation. The faith in Christ that saves us from our sins involves an internal transformation that has external implications. According to Jesus, you can tell someone is a follower of Christ by the fruit of his or her life, and the writers of the New Testament show us that the fruit of faith in Christ involves material concern for the poor. Caring for the poor is one natural overflow and a necessary evidence of the presence of Christ in our hearts. If there is no sign of caring for the poor in our lives, then there is reason to at least question whether Christ is in our hearts." "We say things such as, 'The safest place to be is in the center of God's will.' We think, If it's dangerous, God must not be in it. If it's risky, if it's unsafe, if its' costly, if must not be God's will. But what if these factors are actually the criteria by which we determine something is God's will? What if we began to look at the design of God as the most dangerous option before us? What if the center of God's will is in reality the most unsafe place for us to be?" In addition to these two books, my small group on Monday night listened to a talk about being willing to take risks to follow God. One of the things that stuck with me was the speaker encouraging us "not to try to tame God's spirit within you". I really appreciated reading these books and hearing the talk this week as John and I continue to discern God's will for our lives. If you feel like you are in a spot where your lived out faith is comfortable, I encourage you to read one or both of these books and be inspired to take risks for the advancement of God's kingdom! And check out more great books @ Housewifespice! It seems like so many aspects of Christian life involve trying to find the right balance between truths that seem to be in tension. Christians should be wise and prudent, yet God works through foolishness and weakness. God blesses us with good and pleasant things, yet he also blesses us with trials and crosses. Isn't it interesting that God doesn't just give us simple, detailed, personal instructions for our lives so that we would always know exactly what He wants us to do? If I was making up a religion, I would go for clear instructions. I guess that just shows how different made-up religions and Christianity are! I think I appreciate the struggle to understand God's will... I mean, if it was easy, would I keep going back to him in deep, meaningful, connecting prayer? Striking a balance is so important! I think I just need reminding that being wise and prudent doesn't mean being comfortable and complacent. It's a radical leap to open your family up to the unknown of the foster care world. My mother has had a difficult time accepting our call to foster, and is encouraging us not to do it again after our current foster daughter returns home next week. It's a delicate balance between crazy and courageous. For us, we felt the call to foster so strongly that to not obey would have been maddening. As we discern what our next steps are, I'll pray for your family's steps into similar territory. God blesses faithfulness. In the midst of our loss, I have no regret for opening our lives, hearts, and home to the will of God through fostering. Annery, I so appreciate having this blog connection with you! You are continually in our prayers. And I love that you feel that strong call!